Automate your lab and pathology prior authorizations with software driven by artificial intelligence (AI) and exception handling by certified specialists to preserve more revenue. Prior authorization requirements in the laboratory space create unique and complex challenges. The payment lifecycle for laboratories begins with prior authorization. Receiving prior authorization approval after performing a lab test is becoming a less viable option; as is fighting denials for lack of prior authorization approval during the appeal process. Some payors are still allowing retroactive authorizations; however, laboratories which test specimens without prior authorization run the risk of performing uncompensated tests. Processing prior authorizations manually specifically for genetics and molecular testing often creates lost authorizations, decrease in patient satisfaction, and higher denial rates. Also, labs have complex and expensive CPT codes that often create significant challenges in gaining prior authorization approvals. As a provider, you can’t complete the test until you receive the approval, which often requires navigating proprietary and nonstandard workflows. Getting approval is critical to preserving revenue through the entire process. 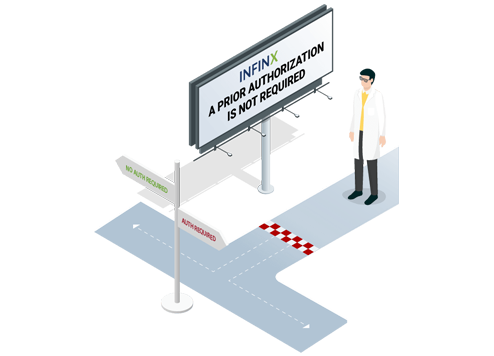 Infinx Patient Access Software for pathology and labs blends automation, integration, cognition, and control to offer you an optimized workflow. It leverages our AI & HI capabilities to provide a robust and seamless solution for managing prior authorization cases. AI optimizes your workflow and automates cases than can be immediately completed or require no-auth. Cases needing more in-depth attention are forwarded to our global team of specialists who can process your prior authorizations with speed and impeccable accuracy. Laboratories and pathology need to re-evaluate its prior authorization strategy. Prior authorizations for labs are complex and inevitably require human intelligence to manage the exceptions. In-house teams often have error rates as high as 35%, which creates a drain on resources and revenue. You can improve your patient access by enhancing and automating your prior authorization process so that you can skip the challenges and see immediate benefits in your workflow. Our solutions help you get ahead of the revenue cycle problem by quickly authorizing and confirming every test rendered and can be billed with near certainty to its accuracy and propensity to collect. Our experience working with payors nationwide, allows you to receive same day appointments within 4 hours, and 100% accuracy and adherence to a 24-hour TAT, enabling you to capture more revenue for your lab. The software automatically sorts the prior authorization by priority of urgency of care, and prepares and files paperwork through the secure EDI with the payor. The Infinx team handles any exceptions. learn more about our prior authorization software for pathology and labs.